This mash-up has worked well in the past, but does this game handle such a mixture as well, or does its rock golem Guardians collapse under the weight of it all? Read on to find out! Masters of Anima has an intriguing setup that plays before you start a new game. In this world, humanity once waged a terrible war with stone Golems. A goddess took pity on humanity and taught them how to harness Anima to fight back. These people were the first Shapers who could harness Anima to construct their own stone soldiers called Guardians. Fast forward to the present, and the threat has been dealt with and locked inside of a mountain. You play as Otto, a young apprentice who is about to become a Shaper himself. His fiancé, Ana, is a powerful Shaper herself, so she’s pressuring him to take it seriously. Things quickly get out of hand when a fellow Shaper, Zahra, goes rogue and sunders the soul of Ana, which divides it into pieces he can use to fulfill his grand scheme. 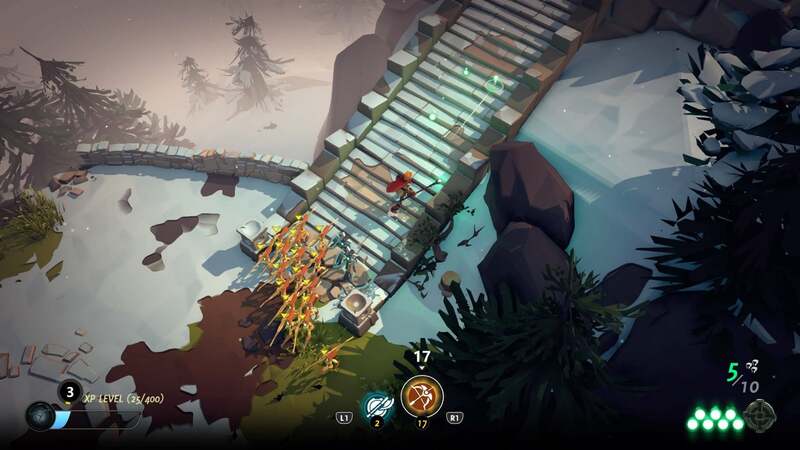 The story has an interesting setup, but from there it’s all pretty standard adventure fare. Otto himself is likable enough, but the villain comes across as a very cartoonish character that’s hard to take seriously. I story with this kind of setup has potential to really dive into some interesting concepts like the nature of life, the soul, and the motivations of its villain. Masters of Anima doesn’t concern itself with lofty themes, instead, the story takes a backseat for the most part. It’s a fun and engaging tale, but I would have liked to see more done with the premise. As a Shaper Otto doesn’t do a lot of damage in combat. You can attack enemies, but your primary function will be summoning Guardians to fight for you in battle. As you progress through the game, you’ll gain access to five different types in total. 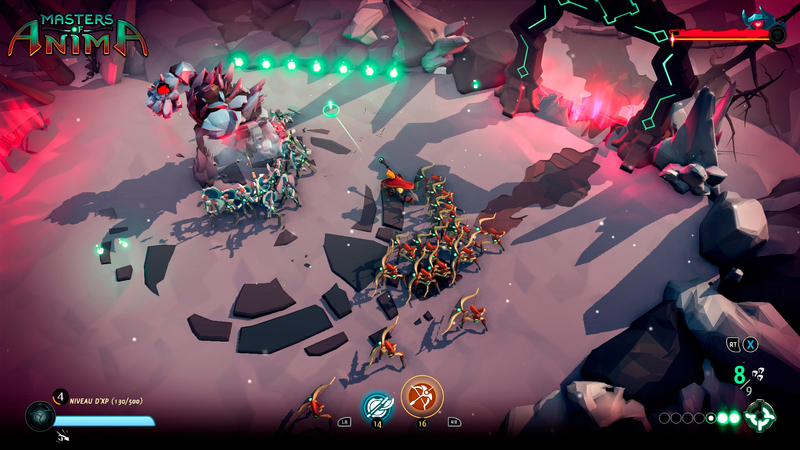 At the beginning, you have fighters and archers to choose from. Summoning them is simple enough, and switching between them is easy. When combat starts, however, these golems begin to show cracks in their skin. For starters, there’s a constant reticle in front of you that rotates with your character. This is where you can command your Guardians to go or attack. It works, but it feels clunky when you’re trying to make a precise command. The ability to move it independently would have been welcome. You can send Guardians out one at a time, or all at once, which is fine. The problem is that it’s difficult to accurately place them as a result of the fixed reticle. While somewhat clunky, it works well for the most part. You can send Guardians to attack, push blocks or destroy obstacles. Summoning them requires Anima, which you can find in the game’s environment. You do get a Guardian that can drain it from enemies, but it’s not very fast. Since your Guardians can be killed pretty easily, even with upgrades, you may find yourself running out of Anima in a fight. At this point, there’s not much you can do. Otto himself is practically powerless to defeat enemies on his own, so I often ended up getting killed fairly quickly if I was unable to summon any additional Guardians. The Guardians themselves will follow your commands to the letter, but they’re not very bright beyond that. They won’t flee when an attack is incoming, and they won’t heal themselves. This results in frantic retreats when a Golem begins to charge their attack. Too often, the Guardians won’t flee fast enough, or they get clogged together in a pack and end up being killed. While this is frustrating, it’s made worse by the slightly clunky reticle system, and the fragility of the Guardians themselves. It’s possible to select specific Guardians, but the cursor that expands to select them is far too slow to use consistently in combat. Otto can buff his units with certain abilities, but again, these don’t make a reasonable difference in combat. All of this is further exacerbated by a rage meter that drains on enemies in combat. They have huge amounts of health, and if this meter runs out before you kill them, they gain even more power and attack more frequently. Levels are very long, and upgrades can only be purchased between them. Furthermore, checkpoints are few and far between. There are some puzzles that break up the combat, but they don’t require a lot of thinking to overcome. 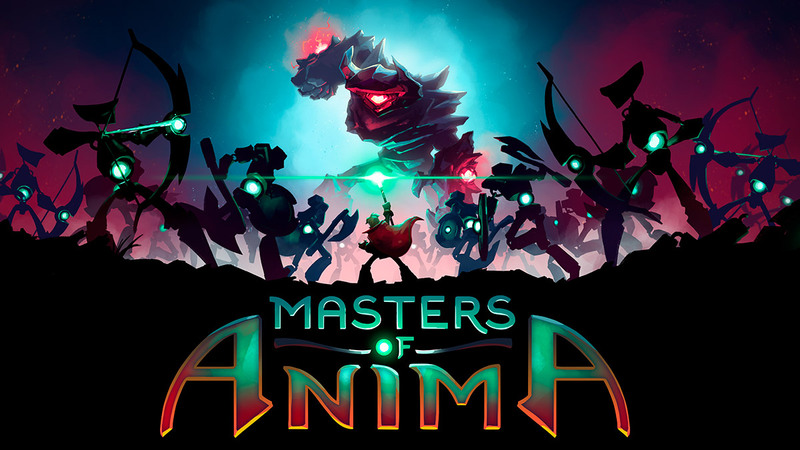 Masters of Anima is a really good idea, but the execution falls short. These small problems build up to create some pretty frustrating combat experiences that would otherwise be very fun. Better command controls, more powerful Guardians, and a buff to Otto’s power would all go a long way towards making it feel balanced. Masters of Anima is a beautiful game to behold. The simple and smooth art style combines a touch of detail to everything, while also offering bursts of color. The voice acting is also solid, with a great performance from Otto himself. Ultimately, Masters of Anima is a very good idea held back by some shortcomings in the balance, controls, and story. While the overall experience could have been better, there’s denying the foundation here is rock solid.